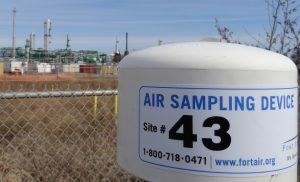 Fort Air Partnership monitors and collects air quality data 24 hours a day, seven days a week using 10 continuous monitoring stations and 47 passive monitors. The data is compared to provincial Ambient Air Quality Objectives, and used to inform policy and management decisions by government and other organizations. When air quality standards are exceeded, we alert Alberta Environment and Parks. This information is accessed by Alberta Health Services to determine if a health advisory should be issued. Whenever possible, the cause of an exceedance is determined. Often, natural causes lead to exceedances, including weather events such as temperature inversions, or smoke from forest fires. The data from our Bruderheim, Fort Saskatchewan, Gibbons, Lamont County, Redwater, Elk Island National Park and portable stations is used in calculating a daily and forecast Air Quality Health Index for each of those locations. We monitor for 19 substances that are known to be emitted by various sources in the airshed. We also monitor for several weather conditions like temperature, wind direction, wind speed and relative humidity and barometric pressure. See Substances Monitored by Station for a complete list of which stations monitor for what substances and weather conditions. Copyright © 2019 Fort Air Partnership. All rights reserved. Site by BubbleUP Web Design Edmonton.